"The first John Hause was born in Germany in the year 1690, and when an infant, on account of Religious Persecutions, he was transported by his 'cousin', Queen Mary II, of Great Britain, House of Stuart, Daughter of James II and Anne Hyde, born 1662, married William, Prince of Orange at the age of 17, reigning 15 years, and died in 1694 of Small Pox, leaving no children. A kind, meek, and noble Queen." Sketch compiled by Alfred Hause in 1904, based on notes by Lewis K. Hause and the Family Bible of Joseph Hause of Ovid, New York. The Stuarts were the first kings of the United Kingdom, and their dynasty reigned in England and Scotland from 1603 to 1714. They ruled during an age of intense religious debate and radical politics. And their actions would have a huge effect on the history of our family. Historically, they were first found in Scotland (their castle is shown above). But their sphere of influence would grow much father than that, or even the United Kingdom. Their original surname, Stewart, derives from the political position of office similar to a governor, known as a steward. It was originally adopted as the family surname by Walter Stewart, 3rd High Steward of Scotland, who was the third member of the family to hold the position. Prior to this, family names were not used, but instead they had patronyms defined through the father; for example the first two High Stewards were known as FitzAlan and FitzWalter respectively. The gallicised spelling was first borne by John Stewart of Darnley after his time in the French wars. During the 16th century, the French spelling Stuart was adopted by Mary, Queen of Scots, when she was living in France. She sanctioned the change to ensure the correct pronunciation of the Scots version of the name Stewart, because retaining the letter 'w' would have made it difficult for French speakers, who followed the Germans in usually rendering "w" as /v/. The spelling Stuart was also used by her second husband, Henry Stuart, Lord Darnley; he was the father of James VI and I, so the official spelling Stuart for the British royal family derives from him. 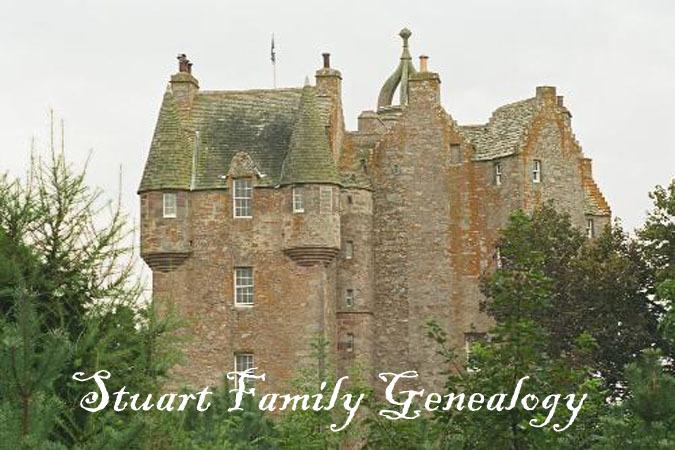 The ancestral origins of the Stuart family are obscuretheir probable ancestry is traced back to Alan FitzFlaad, a Breton who came over to Great Britain not long after the Norman conquest. Alan had been the hereditary steward of the Bishop of Dol in the Duchy of Brittany; Alan had a good relationship with the ruling Norman monarch Henry I of England who awarded him with lands in Shropshire. The FitzAlan family quickly established themselves as a prominent Anglo-Norman noble house, with some of its members serving as High Sheriff of Shropshire. It was the great-grandson of Alan named Walter FitzAlan who became the first hereditary High Steward of Scotland, while his brother William's family would go on to become Earls of Arundel. The sixth High Steward of Scotland, Walter Stewart (1293-1326), married Marjorie, daughter of Robert the Bruce, and also played an important part in the Battle of Bannockburn gaining further favour. Their son Robert was heir to the House of Bruce, the Lordship of Cunningham and the Bruce lands of Bourtreehill; he eventually inherited the Scottish throne when his uncle David II died childless in 1371. ROBERT II (2 Mar 1316 - 19 Apr 1390) reigned as King of Scots from 1371 to his death as the first monarch of the House of Stewart. He was the son of Walter Stewart, 6th High Steward of Scotland and of Marjorie Bruce, daughter of the Scottish king Robert the Bruce by his first wife Isabella of Mar. Robert married Elizabeth Mure around 1348, legitimising his four sons and five daughters. His subsequent marriage to Euphemia de Ross in 1355 produced two sons and two surviving daughters and provided the basis of a future dispute regarding the line of succession. 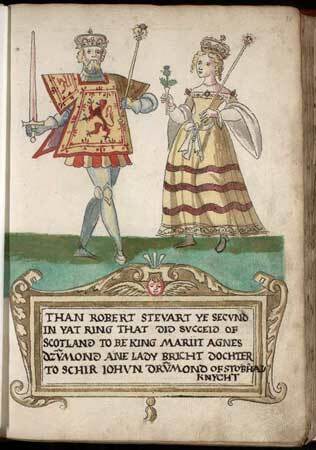 ROBERT III (c.1337/40 - 4 April 1406), born John Stewart, was King of Scots from 1390 to his death. 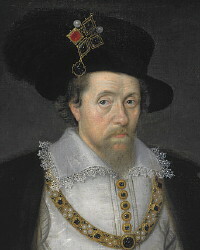 He was known primarily as John, Earl of Carrick before ascending the throne at the age of 53. He was the eldest son of Robert II and Elizabeth Mure and was legitimated with the marriage of his parents in 1347. He married Anabella Drummond, daughter of Sir John Drummond of Stobhall before 31 May 1367 when the Steward ceded to him the earldom of Atholl. In 1390, Robert II died and Carrick ascended the throne as Robert III but without authority to rule directly. JAMES I (July 1394 - 21 Feb 1437), the youngest of three sons, was born in Dunfermline Abbey to King Robert III and his wife Annabella Drummond. 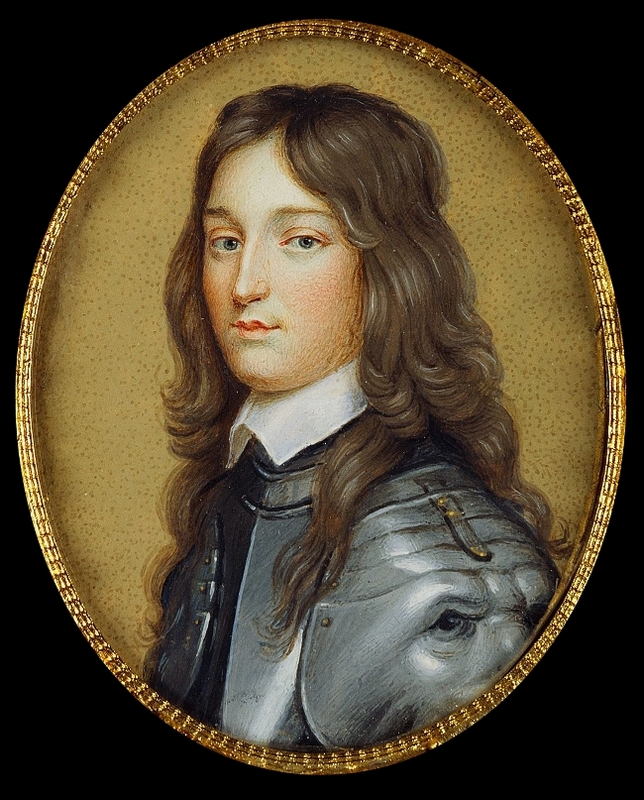 By the time he was eight, both of his elder brothers were deadâ€”Robert had died in infancy but David, Duke of Rothesay, died suspiciously in Falkland Palace while being detained by his uncle, Robert, Duke of Albany. Although Albany was exonerated by parliament, fears for James's safety grew through the winter of 1405-1406 and plans were made to send him to France. In February 1406, James was accompanying nobles close to his father when they clashed with supporters of Archibald, 4th Earl of Douglas, forcing the prince to take refuge in the castle of the Bass Rock, a small islet in the Firth of Forth. He remained there until mid-March when he boarded a vessel bound for France, but on 22 March while off the English coast, pirates captured the ship and delivered James to Henry IV of England. The ailing Robert III died on 4 April and the 12-year-old James, now the uncrowned King of Scots, would not regain his freedom for another 18 years. James married Joan Beaufort, daughter of the Earl of Somerset in February 1424 shortly before his release in April when they journeyed to Scotland. James was assassinated at Perth on the night of 20/21 February 1437 in a failed coup by his uncle and former ally Walter Stewart, Earl of Atholl. 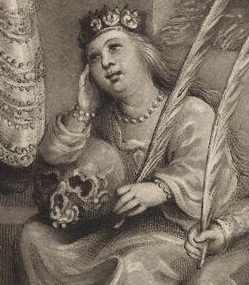 Queen Joan, although wounded, managed to evade the attackers and was eventually reunited with her son James II in Edinburgh Castle. JAMES II (16 Oct 1430 - 3 Aug 1460) reigned as King of Scots from 1437 on. He was the son of King James I and Joan Beaufort. Nothing is known of his early life, but by his first birthday his twin and only brother, Alexander, who was also the older twin, had died, thus making James the heir apparent and Duke of Rothesay. On 21 February 1437, James I was assassinated and the six-year-old Duke of Rothesay immediately succeeded him as James II. In 1449, nineteen-year-old James married fifteen-year-old Mary of Guelders, daughter of the Duke of Gelderland. She bore him seven children, six of whom survived into adulthood. Subsequently, the relations between Flanders and Scotland improved. James's nickname, Fiery Face, referred to a conspicuous vermilion birthmark on his face which appears to have been deemed by contemporaries an outward sign of a fiery temper. 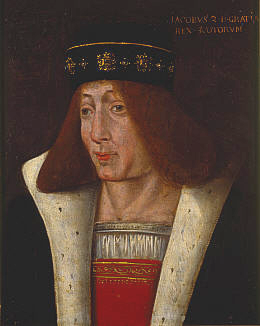 JAMES III (10 Jul 1451/May 1452 - 11 June 1488) was King of Scots from 1460 to 1488. James was an unpopular and ineffective monarch owing to an unwillingness to administer justice fairly, a policy of pursuing alliance with the Kingdom of England, and a disastrous relationship with nearly all his extended family. However, it was through his marriage to Margaret of Denmark that the Orkney and Shetland islands became Scottish. His reputation as the first Renaissance monarch in Scotland has sometimes been exaggerated, based on attacks on him in later chronicles for being more interested in such unmanly pursuits as music than hunting, riding and leading his kingdom into war. 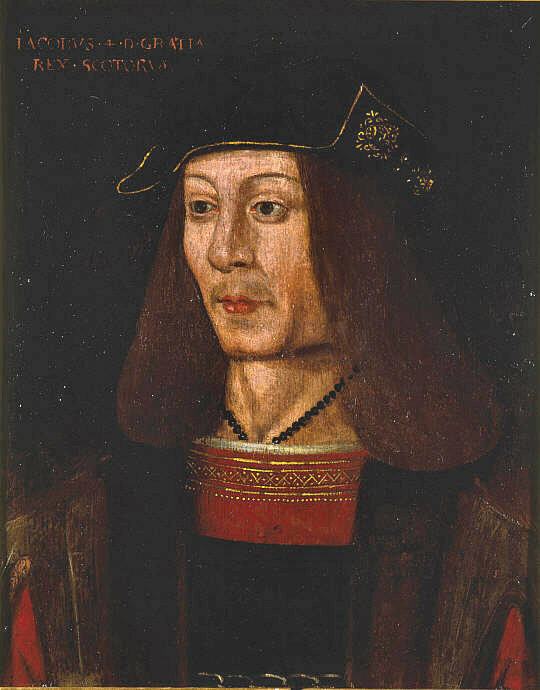 JAMES IV (17 Mar 1473 - 9 Sep 1513) was the King of Scotland from 11 June 1488 to his death. He assumed the throne following the death of his father, King James III, in the Battle of Sauchieburn, a rebellion in which the younger James played an indirect role. 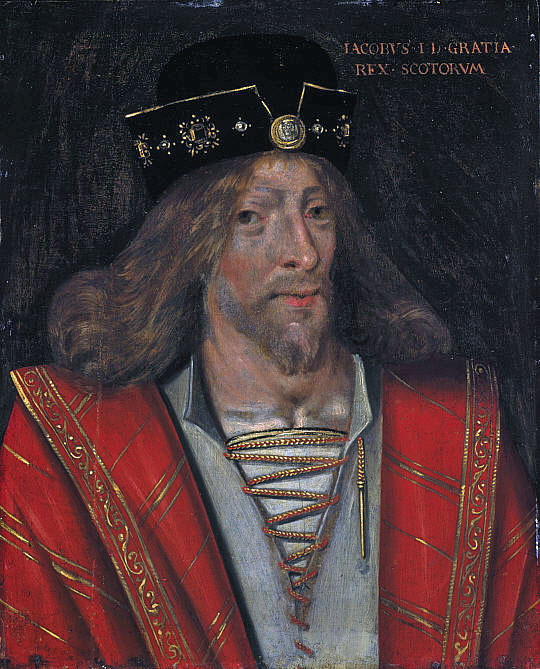 He is generally regarded as the most successful of the Stewart monarchs of Scotland, but his reign ended in a disastrous defeat at the Battle of Flodden, where he became the last monarch not only from Scotland, but from all of Great Britain, to be killed in battle. 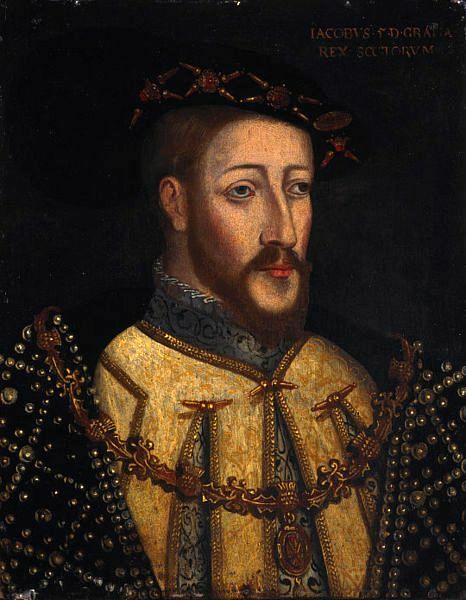 JAMES V (10 Apr 1512 - 14 Dec 1542) was King of Scotland from 9 September 1513 until his death, which followed the Scottish defeat at the Battle of Solway Moss. James was the son of King James IV of Scotland and his wife Margaret Tudor, a daughter of Henry VII of England and sister of Henry VIII, and was the only legitimate child of James IV to survive infancy. 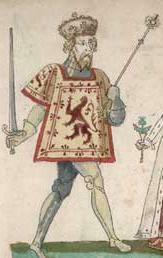 According to legend James was nicknamed "King of the Commons" as he would sometimes travel around Scotland disguised as a common man, describing himself as the "Gudeman of Ballengeich" ('Gudeman' means 'landlord' or 'farmer', and 'Ballengeich' was the nickname of a road next to Stirling Castlemeaning 'windy pass' in Gaelic). His only surviving legitimate child, Mary, succeeded him when she was just six days old. 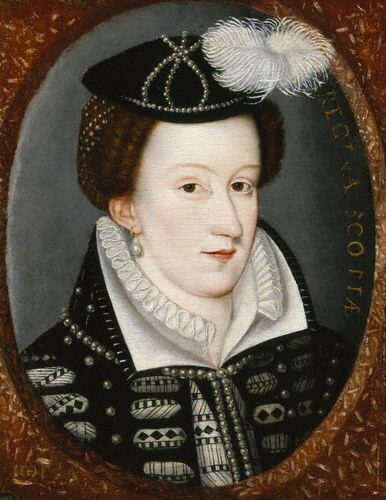 MARY, QUEEN OF SCOTS (8 Dec 1542 - 8 Feb 1587), also known as MARY STUART, reigned over Scotland from 14 Dec 1542 to 24 Jul 1567. Mary, the only surviving legitimate child of King James V, spent most of her childhood in France while Scotland was ruled by regents, and in 1558, she married the Dauphin of France, Francis. He ascended the French throne as King Francis II in 1559, and Mary briefly became queen consort of France, until his death in December 1560. Widowed, Mary returned to Scotland, arriving in Leith on 19 August 1561. Four years later, she married her first cousin, Henry Stuart, Lord Darnley and in June 1566 they had a son, James. In February 1567, Darnley's residence was destroyed by an explosion, and he was found murdered in the garden. James Hepburn, 4th Earl of Bothwell, was generally believed to have orchestrated Darnley's death, but he was acquitted of the charge in April 1567, and the following month he married Mary. Following an uprising against the couple, Mary was imprisoned in Loch Leven Castle. On 24 July 1567 she was forced to abdicate in favour of her one-year-old son. After an unsuccessful attempt to regain the throne, she fled southwards seeking the protection of her first cousin once removed, Queen Elizabeth I of England. Mary had once claimed Elizabeth's throne as her own, and was considered the legitimate sovereign of England by many English Catholics, including participants in a rebellion known as the Rising of the North. Perceiving her as a threat, Elizabeth had her confined in various castles and manor houses in the interior of England. After eighteen and a half years in custody, Mary was found guilty of plotting to assassinate Elizabeth in 1586. She was beheaded the following year at Fotheringhay Castle. 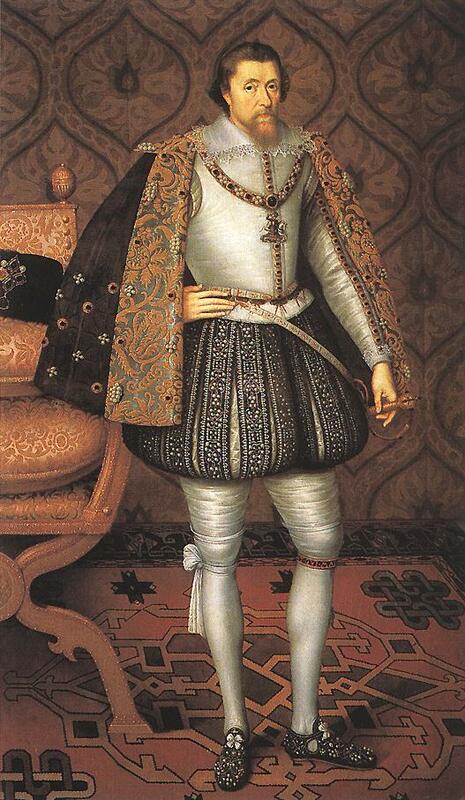 JAMES VI and I (JAMES CHARLES STUART; 19 Jun 1566 - 27 Mar 1625) was King of Scotland as James VI from 24 July 1567 and King of England and Ireland as James I from the union of the Scottish and English crowns on 24 March 1603 until his death in 1625. The kingdoms of Scotland and England were individual sovereign states, with their own parliaments, judiciaries, and laws, though both were ruled by James in personal union. James was the son of Mary, Queen of Scots, and a great-great-grandson of Henry VII, King of England and Lord of Ireland, positioning him to eventually accede to all three thrones. 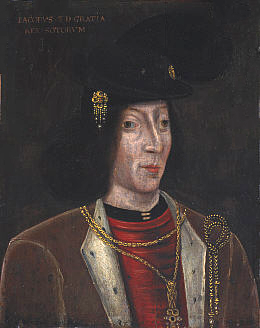 James succeeded to the Scottish throne at the age of thirteen months, after his mother was compelled to abdicate in his favour. Four different regents governed during his minority, which ended officially in 1578, though he did not gain full control of his government until 1583. In 1603, he succeeded the last Tudor monarch of England and Ireland, Elizabeth I, who died without issue. He continued to reign in all three kingdoms for 22 years, a period known after him as the Jacobean era, until his death in 1625 at the age of 58. 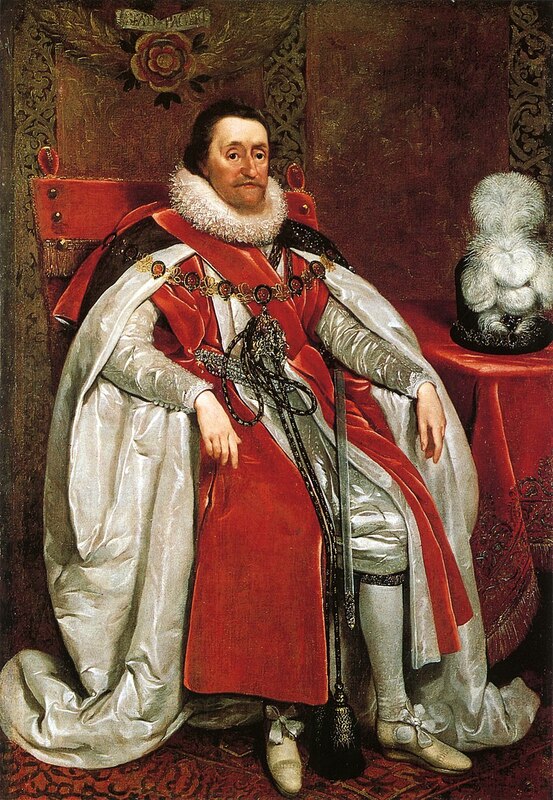 King James I of England (19 June 156627 March 1625) ruled over England, Scotland and Irelandthe first Sovereign to reign in the three realms simultaneouslyand the first English monarch of the Stuart dynasty, succeeding the last Tudor monarch, Elizabeth I, who died unmarried and childless. He was the only son of Mary Queen of Scots, and reigned in Scotland as James VI for 36 years before becoming James I of the combined kingdoms after Elizabeth's death in 1603. James is considered to have been one of the most intellectual and learned individuals ever to sit on the English or Scottish Throne, but also impulsive and conceited, with the nickname "the wisest fool in Christendom." Luminaries such as Sir Francis Bacon and William Shakespeare flourished during his reign (Shakespeare's company became The King's Men, which also required them to act as courtierssomething the poet wasn't keen on). James himself was a talented scholar, writing works such as Dæmonologie (1597), The True Law of Free Monarchies (1598), Basilikon Doron (1599) and A Counterblast to Tobacco (1604). James was a popular and successful monarch in Scotland, but the same was not true in England. There were allegations that he was a homosexual. When James inherited the English Throne in 1603, it was openly joked in London that Rex fuit Elizabeth: nunc est regina Jacobus (Elizabeth was King: now James is Queen). But his biggest public relations problem had to do with religion. There was a strong Catholic minority in England, a few of who tried to blow up Parliament in 1605 with Guy Fawkes. The Church of England, meanwhile, had splintered into a radical Puritan movement, which was taking over that same Parliament. And neither side liked James. He was unable to deal with a hostile English Parliament, and the refusal on the part of the House of Commons to impose sufficiently high taxes crippled the royal finances. But he endeared himself to Protestants by marrying Anne of Denmarka Princess from a Protestant country and daughter of Frederick II of Denmarkby proxy in 1589. They married again, this time with both parties personally present, on 21 January 1590 at Krondborg during James's visit to Denmark. Soon following his return via Leith on 1 May, he attended the North Berwick Witch Trial, in which several people were convicted of having used witchcraft to create a storm in an attempt to sink the ship on which James and Anne had been traveling. This made him very concerned about the threat that witches and witchcraft were posing to himself and the country. He wrote the aforementioned Dæmonologie (Demonology). As a result, hundreds of females were put to death for witchcraft; their bodies were found in what used to be called Nor Loch (now Princes Street Gardens). This event set the tone for what our ancestors in Salem, Massachusetts, would face a hundred years later in America. HENRY FREDERICK, Prince of Wales KG (19 Feb 1594 - 6 Nov 1612) was the elder son of James VI and I, King of England and Scotland, and his wife, Anne of Denmark. His name derives from his grandfathers: Henry Stuart, Lord Darnley, and Frederick II of Denmark. Prince Henry was widely seen as a bright and promising heir to his father's thrones. However, at the age of 18, he predeceased his father when he died of typhoid fever. His younger brother Charles succeeded him as heir apparent to the English, Irish and Scottish thrones. 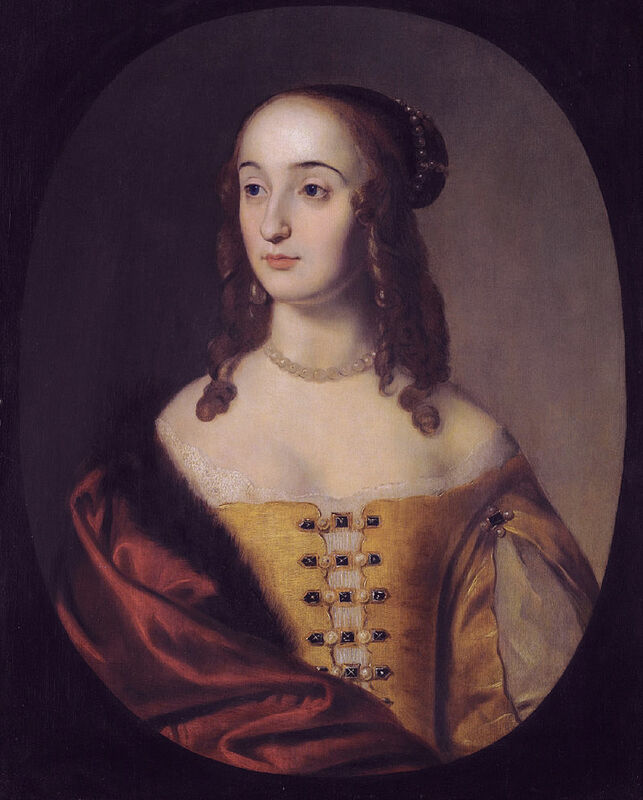 ELIZABETH STUART (19 Aug 1596 - 13 Feb 1662) was Electress of the Palatinate and briefly Queen of Bohemia as the wife of Frederick V of the Palatinate. Due to her husband's reign in Bohemia lasting for just one winter, Elizabeth is often referred to as "The Winter Queen." 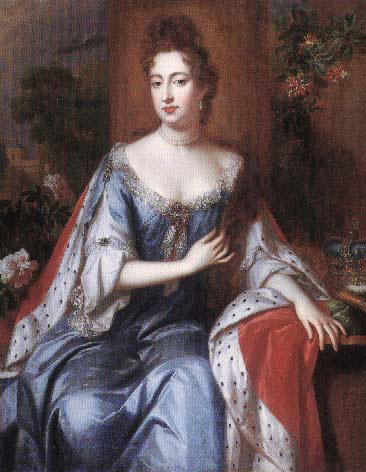 With the demise of the Stuart dynasty in 1714, Elizabeth's grandson succeeded to the British throne as George I of Great Britain, initiating the Hanover line of succession. The reigning British monarch, Elizabeth II, is Elizabeth Stuart's direct descendant of the 10th and 11th generation through different paths. MARGARET STUART (24 Dec 1598 - Mar 1600) was born on Christmas Eve 1598, becoming the second daughter of King James VI of Scotland by Anne of Denmark, daughter of Frederick II of Denmark. Sometime in March 1600, Margaret died of an unknown illness and was embalmed, her body decorated with flannel, crimson silk and Florence ribbon. She was transported from Linlithgow to Edinburgh and was privately interred in Holyrood Abbey, now in ruins. Three years later, her father ascended the throne of England. HM CHARLES I (19 Nov 1600 - 30 Jan 1649) became heir apparent to the thrones of England, Scotland and Ireland on the death of his elder brother, Henry Frederick, in 1612. He married the Bourbon princess Henrietta Maria of France in 1625. 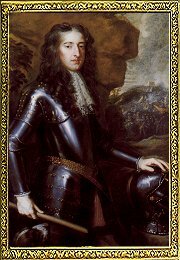 Charles believed in the divine right of kings and thought he could govern according to his own conscience.. His religious policies, coupled with his marriage to a Roman Catholic, generated the antipathy and mistrust of Reformed groups such as the English Puritans and Scottish Covenanters. His attempts to force the Church of Scotland to adopt high Anglican practices led to the Bishops' Wars, strengthened the position of the English and Scottish parliaments and helped precipitate his own downfall. 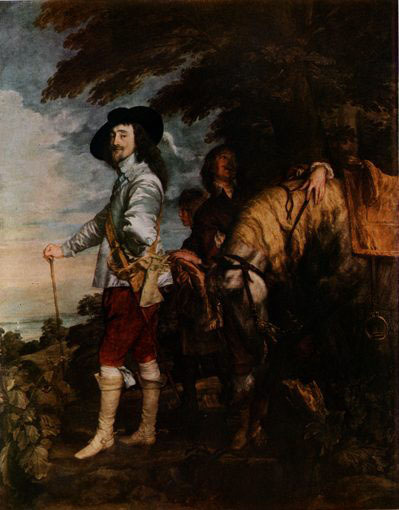 From 1642, Charles fought the armies of the English and Scottish parliaments in the English Civil War. After his defeat in 1645, he surrendered to a Scottish force that eventually handed him over to the English Parliament. Charles refused to accept his captors' demands for a constitutional monarchy, and temporarily escaped captivity in November 1647. Re-imprisoned on the Isle of Wight, Charles forged an alliance with Scotland, but by the end of 1648 Oliver Cromwell's New Model Army had consolidated its control over England. Charles was tried, convicted, and executed for high treason in January 1649. The monarchy was abolished and a republic called the Commonwealth of England was declared. 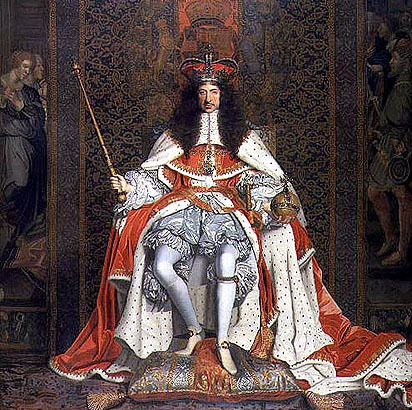 The monarchy was restored to Charles's son, Charles II, in 1660. ROBERT BRUCE STUART, Duke of Kintyre and Lorne (18 Jan 1602 - 27 May 1602) was born at Dalkeith Castle, Scotland. On 2 May 1602 he was created Duke of Kintyre and Lorne, Marquess of Wigton, Earl of Carrick and Lord of Annandale, all in the Peerage of Scotland. On his death, at the age of four months, all his titles, created only 25 days earlier, became extinct. He died at Dunfermline Palace, Fife, Scotland and was buried at Dunfermline Abbey. Unnamed son who was born and died in May of 1603. SOPHIA STUART (22 Jun 1606 - 23 Jun 1606) was born at Greenwich Palace and died there the next day. She was buried in King Henry's Chapel, Westminster Abbey, in a monument designed by Maximilian Colt that resembles a stone cradle. She was likely named for her maternal grandmother, Sophie of Mecklenburg-Güstrow. At first, James and his new queen were close, but they gradually drifted apart. They decided to live apart after the death of their last child, Sophia. James's daughter in the Palatinate, named Elizabeth Stuart, would play an extremely important role in the story of our family. (In fact, if you believe Hause family legend, we're related to her.) She was said to be incredibly beautiful, and she attracted most of the royal suitors of Europe (she was nicknamed the Queen of Hearts). But Elizabeth was finally married in 1613 to Elector Palatine Frederick V, in order to cement an alliance between English and German Protestantism. The wedding of the two 16-year-olds was held on St. Valentine's Day in 1613 at the Chapel Royal at the Palace of Whitehall in London, England. As the wedding was a private affair and not open to the public (impossible to imagine, now, right? ), only the courtiers saw Elizabeth in her queenly attire of a white satin gown with diamonds sewn into the sleeves. Her hair was plaited down the back to her waist with gold spangles, pearls, and diamonds inserted between every plait. She wore a gold crown with pearls and diamonds. The court celebrated the wedding with days of feasts, sports in the palace tiltyard, performances of masques, mock battles between galleons in the River Thames, and fireworks along the river that night. Unfortunately, when Frederick tried to take over Bohemia, everything fell apart. James I was allied with Catholic Spain, an opponent of Elizabeth's Palatinate. This occurred because James had been faced with financial difficulties after Parliament refused to approve new taxes, and he had sought to enter into a profitable alliance with Spain by marrying his eldest son, Charles, Prince of Wales, off to the daughter of the King of Spain. The proposed alliance with a Roman Catholic kingdom was not well-received in Protestant England, especially when the Spanish were trying to overthrow his daughter. Frederick and Elizabeth were defeated and exiled to Holland, and the Spanish took over the Palatinate. This created a wedge in the family that lasted for the next Century, and doomed the dynasty. The union turned out to be a strong one, outlasting his rule over the Palatinate, through years of exile. Frederick and Elizabeth took up their residence in Holland, where she courageously endured privation and misfortune. She received little support from abroad, even from her son Charles Louis, who was restored to the Palatinate in 1648. HEINRICH FRIEDRICH aka HENRY FREDERICK, Electoral Prince of the Palatinate, (1 Jan 1614 - 7 Jan 1629) was the eldest son of Frederick V and Elizabeth. Henry Frederick drowned at the age of 15. He was on his way to Amsterdam to see the captured Spanish treasure fleet there and drowned crossing the Haarlemmermeer. KARL I LUDWIG aka CHARLS LOUIS, Elector Palatine KG (22 Dec 1617 - 28 Aug 1680), the second son of Frederick V and Elizabeth, gained a new title of Elector Count Palatine of the Rhine, Archtreasurer of the Empire, as well as most of his father's lands as part of the Peace of Westphalia in 1648 at the conclusion of the Thirty Years War. Karl Ludwig reigned over a largely devastated country, and consequently his reign was not especially eventful. 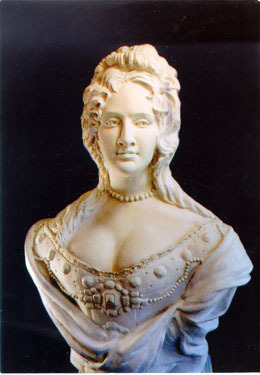 The most notable facet of his reign was probably his unilateral divorce of his wife, Charlotte of Hesse-Kassel, and subsequent bigamous marriage to Marie Luise von Degenfeld. This second wife was given the unique title of Raugräfin ("Waste Count"), and their children were known as the Raugraves. ELISABETH OF HERVORDEN; ELISABETH VON DER PFALZ (26 Dec 1618 - 11 Feb 1680), also known as Elisabeth of Bohemia, Princess Elisabeth of the Palatinate, or Princess-Abbess of Herford Abbey, was the eldest daughter of Frederick V and Elizabeth Stuart. "Princess Palatine" was actually a philosopher best known for her correspondence with René Descartes. She was critical of Descartes's dualistic metaphysics and her work anticipated the metaphysical concerns of later philosophers. In 1633, Elisabeth received a proposal of marriage from Władysław IV Vasa, King of Poland. The marriage would have been beneficial to the Palatine fortunes, but the king was a Catholic, and Elisabeth refused to convert from her Protestant faith in order to facilitate the marriage. In 1660, Elisabeth entered the Lutheran convent at Herford, and in 1667 she became abbess of the convent. While the convent was Lutheran, Elisabeth was a Calvinist. As Abbess, she presided over the convent and also governed the surrounding community of 7,000 people. The convent became a refuge from religious persecution for people and welcomed more marginal religious sects, including the Labadists. 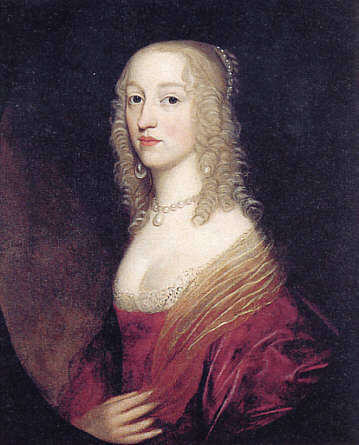 Elisabeth died on February 12, 1680. She was buried in the Abbey Church of Herford. 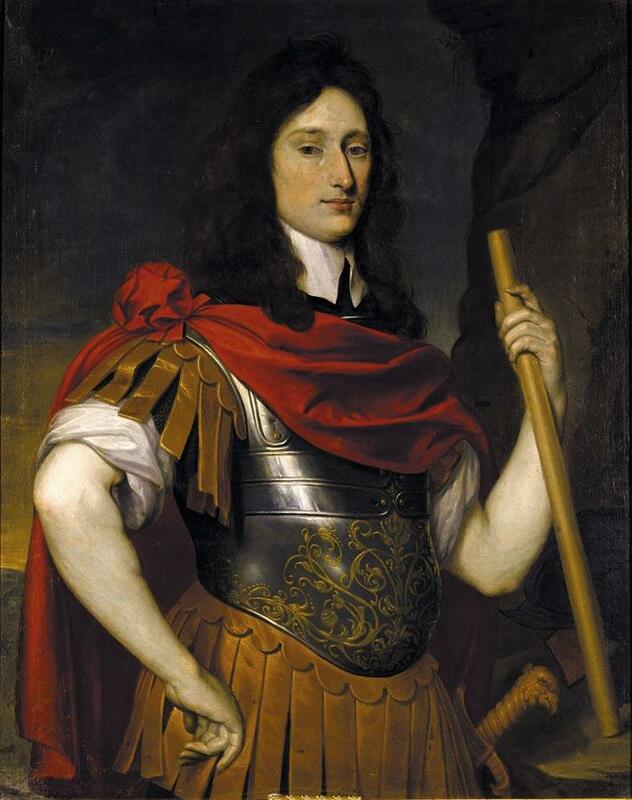 PRINCE RUPERT of the Rhine, Duke of Cumberland, KG, PC, FRS (17 Dec 1619 - 29 Nov 1682) was a noted soldier, admiral, scientist, sportsman, colonial governor and amateur artist during the 17th century. He first came to prominence as a Cavalier cavalry commander during the English Civil War. Born in Prague, he grew up in the Netherlands and studied at Leiden. Active in the later part of the Thirty Years War against the Holy Roman Empire, he was at the siege of Breda (1637) and was taken prisoner (1638). Released in 1641, he went to the aid of his uncle, King Charles I of England, in the civil wars. Despite his youth Rupert became an outstanding royalist general. During the Restoration of the Stuart kings under Charles II (1660), he became a privy councilor to Charles II, and, as an admiral, played an important part in the Dutch Wars. A man of many artistic and scientific interests, Rupert also took part in colonial and commercial schemes. Rupert shaped the political geography of modern CanadaRupert's Land was named in his honour, and he was a founder of the Hudson's Bay Company. He also played a role in the early African slave trade. MAURICE, Prince Palatine of the Rhine KG (16 Jan 1621 ns. - Sep 1652), was born at Küstrin Castle, in Brandenburg. He accompanied his elder brother, Prince Rupert of the Rhine, to take the part of their uncle Charles I in the English Civil War in 1642. He served under Rupert with the cavalry at the Battle of Powick Bridge, where he was wounded, and the Battle of Edgehill. He commanded the army in Gloucestershire which engaged Sir William Waller in several battles in 1643, including the victory of Ripple Field (13 April), culminating in the Royalist victory at the Battle of Roundway Down (13 July). He took command of the army in Cornwall and campaigned in the southwest for the remainder of the year. In April 1644, he besieged Lyme Regis, but was forced to give up the siege in June, at considerable cost to his military reputation. He fought as a subordinate at the Battle of Lostwithiel and the Second Battle of Newbury, and under Rupert at the Battle of Naseby. He attempted to defend Rupert's surrender of Bristol in 1645 to Charles. While unsuccessful, he did not share in Rupert's disgrace. Banished with Rupert in October 1646, he served with the French army in Flanders, but rejoined Rupert in 1648 as vice-admiral of his fleet. He was created a Knight of the Garter in exile in 1649. In 1652, while sailing for the West Indies, specifically near the Virgin Islands, he was caught in a hurricane and went down with his flagship, HMS Defiance. 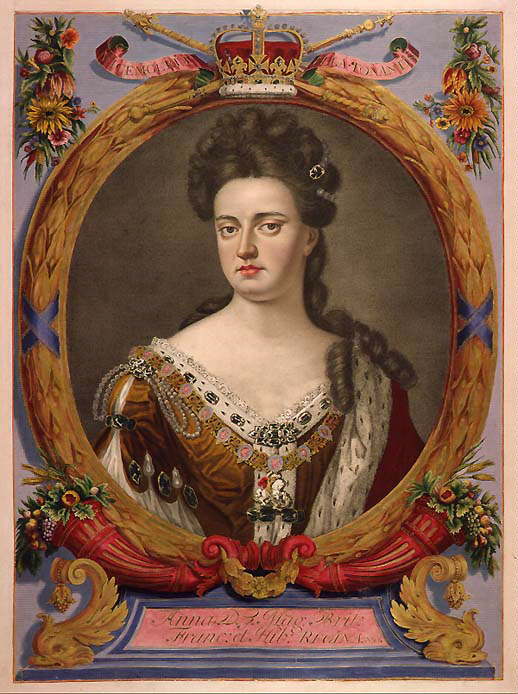 LOUISE HOLLANDINE of the Palatinate (18 Apr 1622 - 11 Feb 1709) was a talented portrait painter and graphic artist, a talent that she shared with her brother, Prince Rupert. She was student of Gerard van Honthorst and painted so ably in his style that some of her works were attributed to him. For unknown reasons and to the dismay of her Protestant family, in December 1657 she fled to France and converted to the Roman Catholic faith. On 25 March 1659 she became a novice and on 19 Sep 1660 a nun in the Cistercian Maubuisson Abbey. With the support of King Louis XIV, she became Abbess of Maubuisson in August 1664. LOUIS (21 Aug 1624 - 24 Dec 1624) died as an infant. 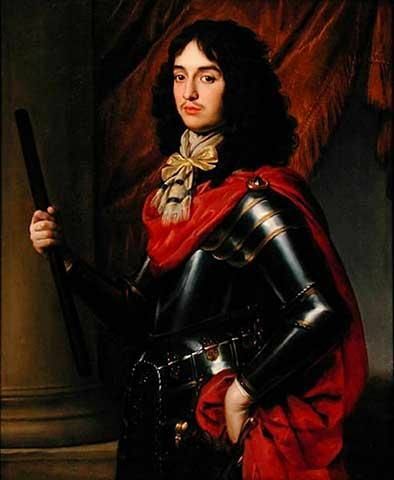 EDWARD OF BAVARIA aka EDUARD, PRINZ VON DER PFALZ (5 Oct 1625 - 10 Mar 1663), was born in The Hague, where his parents lived in exile after his father lost the Battle of White Mountain and was driven from the thrones of both Bohemia and the Palatinate. His father, a Calvinist, died on 29 November 1632, when Edward was seven years old. 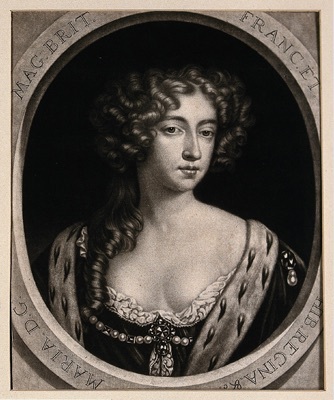 On 24 Apr 1645, Edward secretly married in Paris a French princess of Italian extraction, Anna Gonzaga (1616-1684), nine years older than him. Anna was a daughter of Carlo I, Duke of Mantua. Edward's prompt conversion vindicated the couple at the French royal court, despite his mother's threats to disown any of her children who embraced the Catholic Church. The couple took up residence in Paris, where they were referred to as the Prince and Princess Palatine, her inheritance and the king's generosity enabling them to live according to their rank as princes étrangers. In 1649 he received England's Order of the Garter. Edward and Anna were parents of three daughters: Luise Marie (23 Jul 1647 - 11 Mar 1679) m. Charles Theodore, Prince of Salm; Anne Henriette (23 Jul 1648 - 23 Feb 1723) m. Henri Jules, Prince of Condé; Benedicta Henrietta (14 Mar 1652 - 12 Aug 1730) m. John Frederick, Duke of Brunswick-Lüneburg. 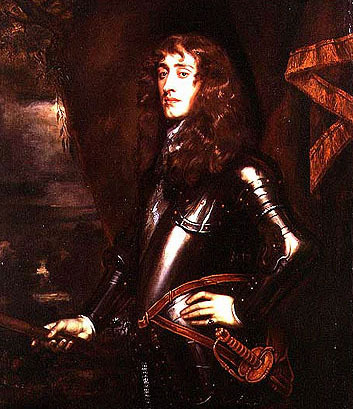 Prince Edward died in Paris on 13 March 1663, aged 37. If Edward had not converted to Catholicism, it is possible that the English throne would have been inherited by his descendants rather than those of his Protestant sister, Sophia. HENRIETTE MARIE, Princess Palatine (17 Jul 1626 - 18 Sep 1651) was the third daughter and ninth child of Frederick V and Elizabeth Stuart. 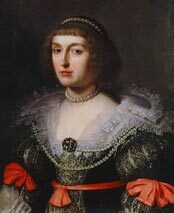 On 4 April 1651, in Sárospatak, Hungary, she was married to Sigismund Rákóczi, brother of George Rákóczi II, Prince of Transylvania. 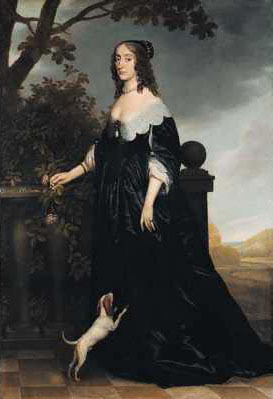 Henriette Marie died unexpectedly on 18 Sep 1651. Her husband followed her to the grave a few months later; both were buried in St. Michael's Church in Gyulafehervar. 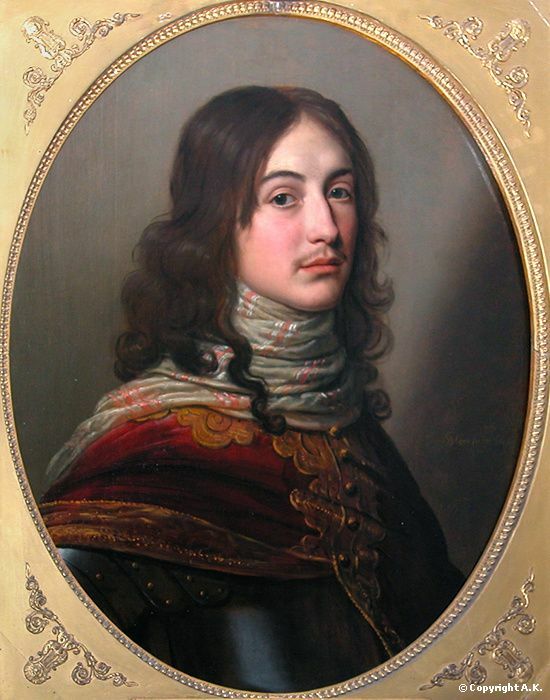 JOHN PHILIP FREDERICK of the Palatinate (16 Sep 1627 - 16 Dec 1650), was born in the Hague, where his parents lived in exile. His father died when Philip was five years old. He and his older brother Edward were educated at the French court, but were sent back to the Hague by request of their mother after the French temporarily took Charles Louis prisoner. On the night of 20 Jun 1646, Prince Philip killed the French exile Lieutenant Colonel Jacques de l'Epinay, Sieur de Vaux, in a duel or fight. Rumours declared that the taunt which had provoked Prince Philip to murder had been a boast that he had enjoyed the favors not only of the Princess Louise, but also of her widowed mother. He became what Elizabeth had sworn that none of her sons should become, a soldier of fortune. Philip entered the military service of the Duke of Lorraine, with the rank of colonel. 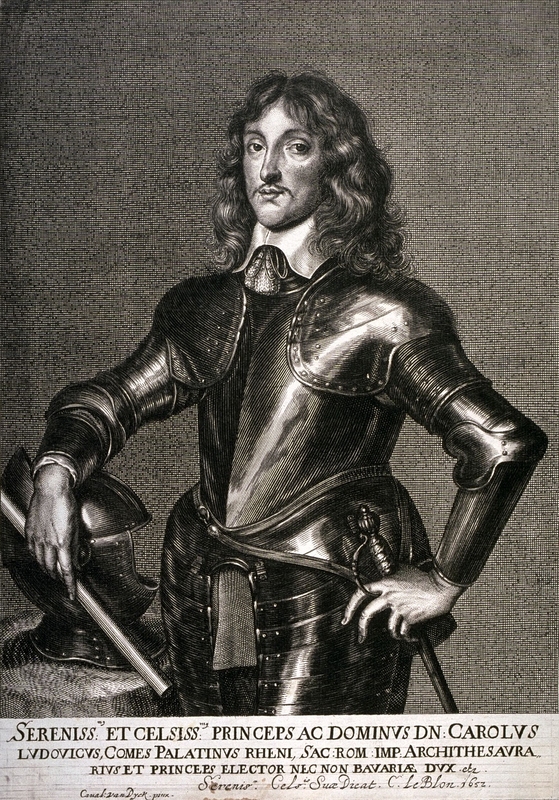 He was killed at the Battle of Rethel, on 16 Dec 1650. His remains were returned to Sedan and were buried in the Church of Saint Charles. 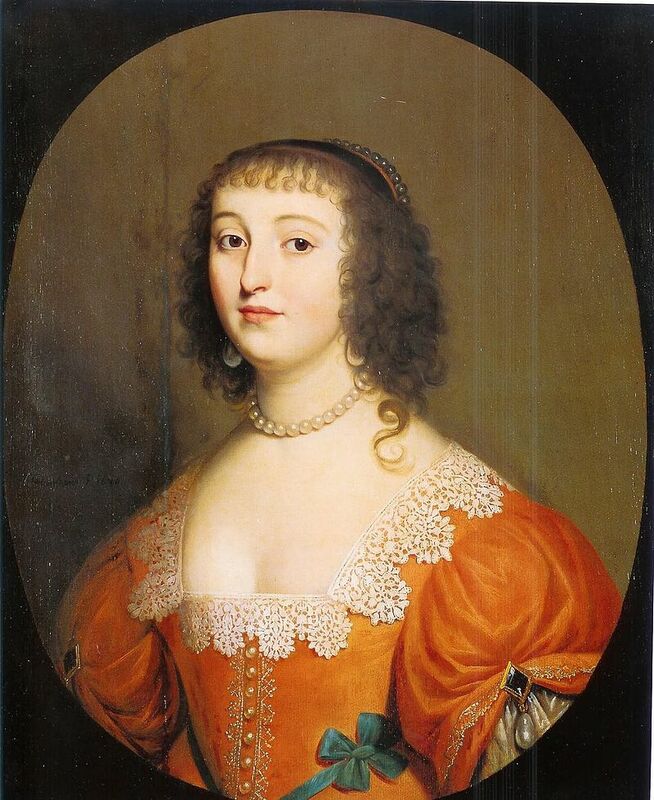 CHARLOTTE of the Palatinate (19 Dec 1628 - 14 Jan 1631), was the fourth daughter of Frederick V and Elizabeth Stuart. Charlotte was born in the Dutch Republic, where her family had sought refuge after the sequestration of their Electorate during the Thirty Years War. She died on 14 Jan 1631 in the Hague, Netherlands, and her father died on 29 Nov 1632, the year after her. Friedrich August von Braunschweig-Lüneburg, Imperial General, died without issue (1661-1691). GUSTAVUS ADOLPHUS of the Palatinate (14 Jan 1632 - 9 Jan 1641) was born in The Hague, where his parents lived in exile after his father lost the Battle of White Mountain and was driven from the thrones of both Bohemia and the Palatinate. He was named after King Gustavus Adolphus of Sweden, a close friend of both his parents. Gustavus died of epilepsy on 9 Jan 1641, at 8 years of age. 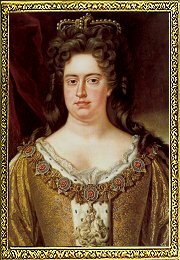 Queen Anne died on 4 March 1619 at Hampton Court Palace and was buried at Westminster Abbey. Rumors were later spread that James was little moved by the death due to his supposed affections for George Villiers. The two met in 1614 and James is said to have nicknamed the young man "Steenie" and bestowed honor upon honor to him, ending with the dukedom of Buckingham in 1623. 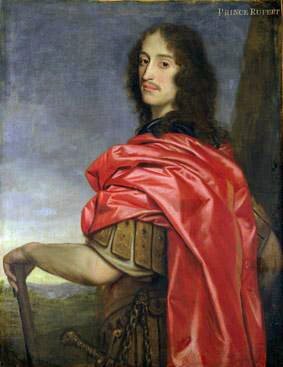 George Villiers was the first non-royal duke to be created for over a century. James lapsed into senility during the last year of his reign. Real power passed to Charles, Prince of Wales and to the Duke of Buckingham. James died in 1625 of ague, probably brought upon by kidney failure and stroke, and was buried in the Henry VII Lady Chapel in Westminster Abbey. Charles, Prince of Wales succeeded him as Charles I.
Charles inherited a troubled country. Calvanist Puritans were revolting from the established churches and leaving for America and religious freedom by the thousands. And James' erratic actions as King led to a bloody civil war in the mid-seventeenth century between Crown and Parliament (the Cavaliers and the Roundheads), resulting in a parliamentary victory for Oliver Cromwell and the execution of Charles I. He suffered his beheading with great dignity, "by no known law and an unknown executioner." There was a short-lived republic (11 years), but the Stuarts soon regained the throne in the Restoration, now with Charles II as King, in 1660. Unlike his father, Charles II was skilled at managing Parliament. It has often been said that Charles was one of the greatest Kings England has ever seen. It was during his reign that the Whig and Tory political parties developed. He famously fathered numerous illegitimate children, of whom he acknowledged fourteen. Known as the "Merry Monarch", Charles was a patron of the arts and less restrictive than many of his predecessors. The dynasty of the Stuarts appeared healthy again. The Stuart Dynasty: James I, Elizabeth (of the Palatinate), Charles I, Charles II, James II. Charles' nephew, the Duke of York, was the next in line to rule. 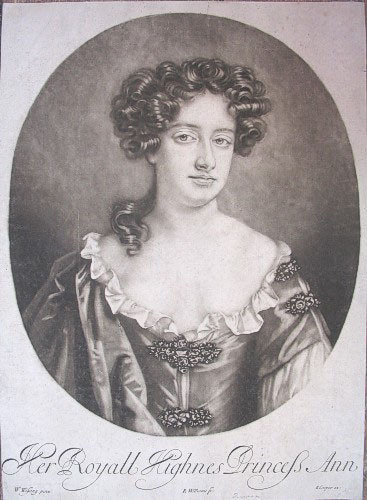 He married Anne Hyde, daughter to Charles II's chief advisor, the Earl of Clarendon. Whether through years of Royal inbreeding or just bad luck, the Stuarts were not a hearty family, and although this union bore eight children, only Mary (linked to the Hause family through this legend) and her younger sister, Anne (linked to the Hauß family here and the Haas family here), survived into adulthood. 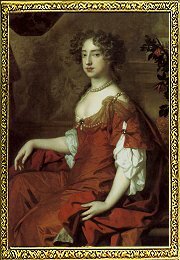 The Duke converted to Roman Catholicism in 1668 or 1669, but Princess Mary and Princess Anne had a Protestant upbringing, pursuant to the command of Charles II. Their mother died in 1671, and then the Duke remarried in 1673, taking as his second wife the Catholic Mary of Modena, also known as Mary Beatrice d'Este. This did not go over well with the largely Protestant Parliament, or the people of England, because the Duke was in line to become the next King.  So the Duke used his daughter, Mary, to ease their discontent. And nothing pleases the masses like a good, old-fashioned Royal Wedding. 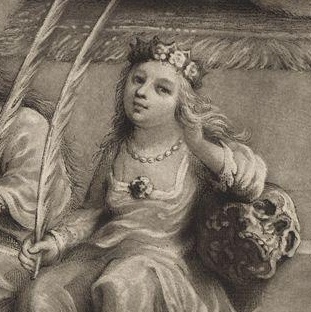 15-year-old Mary and 27-year-old William were married on November 4, 1677, in Mary's bedchamber at St. James's Palace with only the closest relatives attending. The bride was miserable, as were her parents. Sister Anne and her governess Lady Frances Villiers were both ill with smallpox and not present for the ceremony. King Charles II, uncle to the bride and groom, was present for the bedding ceremony, a custom that put the newlywed couple together in the marital bed before witnesses. The purpose of the ritual was to establish the consummation of the marriage. The bedding ritual was fully observed at the wedding of Mary and William: Upon closing the curtains around the marital bed, Charles II remarked, "Now nephew, to your work! Hey! St. George for England." William was one of the most significant players on the European continent, and constantly strove to spread Protestantism and decrease the Catholic influence of France and Spain. Pressured by a very Protestant Parliament, the very Catholic Duke of York agreed to the marriage of Princess Mary to William, falsely assuming that it would improve his popularity. But it didn't work, and in fact it eventually sealed his doom after his ascension to the throne as King of England. Mary started the marriage in the Palatinate feeling very homesick, and to make matters worse, she found William repulsive. She then had three pregnancies that all ended in miscarriage or stillbirth. Still, Mary became popular with the Dutch people, but her husband neglected or even mistreated her. William maintained a long affair with Elizabeth Villiers, one of Mary's ladies-in-waiting. But despite this, Mary eventually came to love both the man and the Netherlands. But the marriage did not ease the fears of Protestant England: By converting to Roman Catholicism on his deathbed, Charles II became the first Roman Catholic to reign over England since the death of Mary I in 1558 and over Scotland since the deposition of Mary, Queen of Scots in 1567. To make matters worse, he had died without legitimate issue in 1685, so Mary's father became King, as James II in England and Ireland, and as James VII in Scotland. But he also was Catholic! Public alarm increased when James's second wife gave birth to a sonJames Francis Edwardin June 1688, for the son would, unlike Mary and Anne, be raised a Roman Catholic. Some charged that the boy was "suppositions," having been secretly brought in as a substitute for the Queen's stillborn baby. Although there was no evidence to support the allegation, Mary publicly challenged the boy's legitimacy, leading to a breach with her father. Parliament was so desperate to prevent a Catholic dynasty that they actually begged a foreign ruler to invade their country! A group of English noblemen called the "Immortal Seven" secretly asked William III to come to England with an army and take over their country. At first William hedged, because he was afraid that if Mary was queen, she would have more power than him. But she assured him that she had no interest in running the British Empire, and he finally agreed to invade. The Dutch army landed on November fifth. This was many centuries before politicians could learn of their approval ratings (or even care about them), but the English people's support for James stood so low that they didn't attempt to save him. On the 11th of December, he tried to flee, but was intercepted, then exiled to France. And with that, William and Mary became rulers of England, the country of her birth, having conquered her very own dad. Mary, although a Sovereign in her own right, did not wield actual power during most of her reign. But she did govern the realm when her husband was abroad fighting warswhich was often. She was very involved in the affairs of the Church; and found herself especially concerned with ecclesiastical appointments. But then Mary died of smallpox in 1694. William then ruled until he died in 1702 after being thrown from his horse. KEEPING ABREAST OF ROYALTY: Portraits of (L-R) then-eligible Princess Mary, a sculpture of Mary, Mary as a Queen, Princess Anne, and Anne as a queen, with their various cleavages, which get noticeably more demure as they get more and powerful. Meanwhile, the Palatine line of the Stuarts, descended from Elizabeth, the daughter of James I, were having Catholic issues, too. Their land was being decimated by the Dauphin, the French, and other German states, who were battling over the remnants of their once-Reformist domain. The official religion of the Palatinate was changing constantly, and the people who stayed true to their chosen religion were being tortured, killed and robbed of their land. Lutherans and Calvinists from the Palatinate such as Johann Simon Haas and Johann Christian Hauß were begging for sanctuary from the ravaged, war-torn area, which for centuries had been a haven for non-Catholic Christians. Not only that, the besieged people had been subjects of Elizabeth Stuart, the daughter of Anne's great, great grandfather, James the First. So in the early 1700's, Anne began recruiting Palatines to sail to the New World, in order to develop and protect British holdings, as described in the last chapter. She began offering poor Palatines good land and religious freedom in the Colonies around 1709, in exchange for indentured servitude. It was a harsh, terrifying and dangerous journey across the ocean to a rough, uncivilized territory filled with hostile Indians, Dutch, French, animal predators and disease. In other words, it was the last place a queen would send a "cousin", as in the (probably) apocryphal Hause legend... but she did send the Hauß and Haas families. ¹The Royal House of Stuart became extinct with the death of Cardinal Henry Benedict Stuart, brother of Charles Edward Stuart, in 1807. Duke Francis of Bavaria is the current senior heir. However, Charles II had a number of illegitimate sons whose surviving descendants in the male line include Charles Gordon-Lennox, 11th Duke of Richmond; Henry FitzRoy, 12th Duke of Grafton; Murray Beauclerk, 14th Duke of St Albans; and Richard Scott, 10th Duke of Buccleuch. In addition, James II's illegitimate son, James FitzJames, 1st Duke of Berwick, founded the House of FitzJames comprising two branches, one in France and one in Spain. The last of the French branch died in 1967; the senior heir of James II's male line descendants is Jacobo Hernando Fitz-James Stuart, 16th Duke of Peñaranda de Duero.